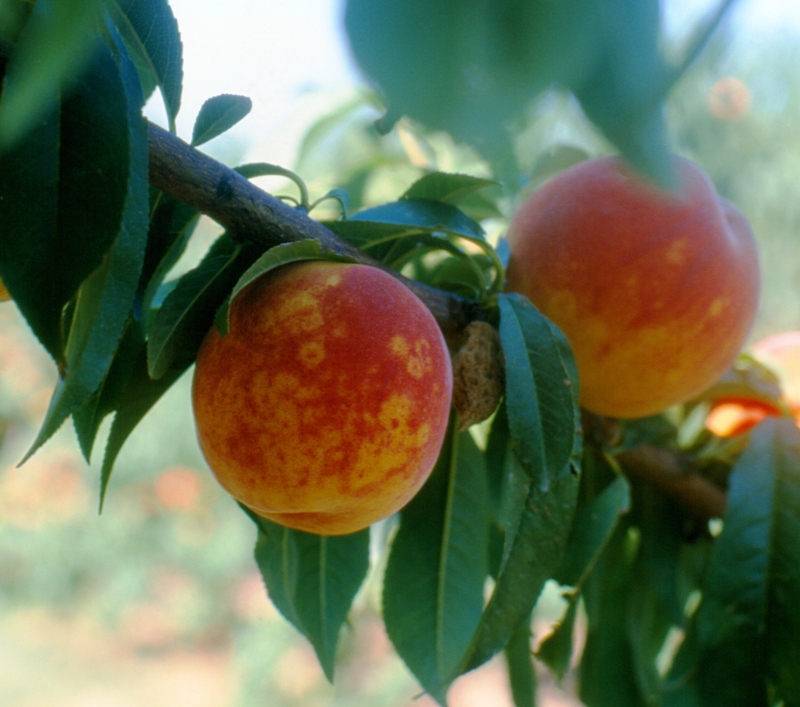 Symptoms of Plum Pox Virus on peach fruit including rings and blotches of uneven color. Courtesy Ontario Ministry of Agriculture, Food and Rural Affairs. © Queen's Printer for Ontario, 2010. Reproduced with permission. Queen's Printer for Ontario, 2010. Invasive species are those plants, animals, and microbes not native to a region which, when introduced either accidentally or intentionally, out-compete native species for available resources, reproduce prolifically, and dominate regions and ecosystems. Because they often arrive in new areas unaccompanied by their native predators, invasive species can be difficult to control. Left unchecked, many of these organisms have the potential to transform entire ecosystems, as native species and those that depend on them for food, shelter, and habitat disappear. The Oregon Invasive Species Council has developed a list of the 100 least wanted species. These organisms threaten to invade at any time and available information allows us to predict that they would have a serious negative economic or ecological impact if they were to become established in the state. Eradication should be seriously considered if incipient populations are found. The costs of eradication are likely to be much less than the impacts associated with permanent establishment. This list is updated annually. If you suspect you have seen one of the 100 least wanted species, call the Invasive Species Hotline, 1-800-INVADER (1-800-468-2337). Alder root rot — Phytophthora alni – In 1993 a new collar-rot disease of European alders (Alnus spp.) was reported in the U.K. A Phytophthora was isolated and shown to comprise a swarm of hybrids between two Phytophthora species: P. cambivora and a Phytophthora close to P. fragariae. Both these ‘parent’ species were probably introduced into Europe. Neither is a pathogen of alder; i.e., the hybridization event may have led to a new host specificity. The event is probably recent and it has been suggested that it occurred in a nursery environment. The hybrids are now spreading across Europe, probably mainly via infested planting stock. A few samples from south-central and interior Alaska were positive for this fungus in 2008. Chalara dieback of ash — Chalara fraxinea (Hymenoscyphus pseudoalbidus) – A recently described fungus killing ash trees, this disease has spread quickly across Europe and was reported for the first time in Great Britain in 2012. Fraxinus excelsior, F. angustifolia, F. mandschurica, F. nigra, F. pennsylvanica, and F. Americana are all reportedly susceptible to the disease; the susceptibility of Oregon’s native ash, F. latifolia, is unknown. Although the life cycle of the fungus is poorly understood, ascospores are forcibly discharged and then wind-dispersed, allowing for rapid spread. Symptoms initially appear as small necrotic spots on leaves, petioles, or rachises. Lesions enlarge expanding along petioles and rachises into stem tissue. Young trees are most vulnerable to rapid death, whereas older trees may take years to die. Other symptoms include leaf necrosis, wilting, premature shedding, cankers on shoots and main stems, and branch dieback. There are no known treatments once a tree becomes infected, although anecdotal evidence suggests some individual trees may be resistant. Oak wilt — Ceratocystis fagacearum – Oak wilt has been found in 21 States in the central part of North America. Oak wilt has also been reported in Texas and New York—outside its main range. It was first recognized as an important disease in 1944 in Wisconsin where over half the oaks have been killed. In West Virginia where predominately oak forests cover 70% of the land area, oak wilt losses average less than one tree per square mile each year. No species of oak is known to be immune to this vascular disease. Plantation-grown Chinese chestnuts can also be naturally infected by the oak wilt fungus. Moreover, inoculation experiments have demonstrated that over 35 native and exotic oaks are susceptible, as well as American and European chestnuts, species of chinkapin, tanoak, and several varieties of apple. Potato wart — Synchytrium endobioticum – A soilborne fungal parasite which is an obligate parasite of certain members of the order Solanaceae with potato (Solanum tuberosum) being the only cultivated host. In Mexico some wild Solanum species are also known as hosts. Has been found in Asia (Bhutan, China, India, Lebanon, Nepal), Africa (Algeria, South Africa, Tunisia), Europe (All countries, except Portugal where it was eradicated), North America (Canada [NFLD], USA [eradicated], Mexico), Pacific (New Zealand’s south island), and South America (Bolivia, Chile, Falkland Is., Peru, Uruguay). On October 24, 2000, the Canadian Food Inspection Agency (CFIA) confirmed the presence of potato wart disease in a single field in Prince Edward Island (P.E.I.) and took immediate steps to prevent its spread. This was the first occurrence of potato wart in an agricultural area outside of Newfoundland and Labrador, where a plant quarantine has been in place since 1912. Disease not yet named — Phytophthora kernoviae – A fungus-like organism found only in the United Kingdom, Ireland, and New Zealand infecting Fagus sylvatica (beech), Rhododendron spp., Quercus robur (English oak), Quercus ilex (holm Oak), Gevuina avellana (Chilean hazelnut), Liriodendron tulipfera (tulip tree), Magnolia stellata, Michelia doltsopa, Pieris formosa and Vaccinium myrtillus. The pathogen was discovered during surveys for P. ramorum and causes similar symptoms on these hosts. It has been found in both nurseries and landscapes. The United Kingdom has an active eradication program in place that includes removal and destruction of entire infected plants including their root balls. Ramorum canker and blight (Sudden Oak Death) — Phytophthora ramorum – A fungus-like organism that infects over 60 plant genera and 100 plant species, killing hosts such as tanoak (Notholithocarpus densiflorus) and Japanese larch (Larix kaempferi), and injuring others such as rhododendron (Rhododendron species). This pathogen is subject to state and federal quarantines designed to contain the disease and prevent its further spread. The disease was first reported to cause leaf blight, stem canker, and tip dieback on nursery-grown rhododendrons and viburnums in Germany and the Netherlands in 1993. At about the same time, many tanoaks and oaks (Quercus sp.) in the San Francisco Bay Area were dying from this same disease. In Oregon, the fungus was found killing tanoak in a few isolated sites just north of Brookings, OR during the summer of 2001. Since the initial discovery, the disease is considered established and Oregon has focused on limiting spread in Curry County through early detection, monitoring, and eradication of symptomatic tanoak trees. Despite these efforts, the quarantine area in Curry County has expanded many times since 2001 from 9 sq. miles to over 500 sq. miles. The rate of disease spread increased most dramatically in 2014 requiring the quarantine area to nearly double in 2015. In the spring of 2003, the disease was discovered in a wholesale nursery in Oregon on Pieris, Viburnum, and Rhododendron and in Washington at a retail outlet affiliated with the Oregon nursery. These and nearby host plants were destroyed. An international shipment of rhododendrons was suspected as the source of contamination for these nurseries. The disease has since been detected in nurseries in California, Oregon, Washington, and other several other states. A federal certification program for nurseries has been in place since 2004 to prevent disease spread through infected nursery stock. The disease was also discovered in a botanical garden landscape on the north end of Bainbridge Island, WA in 2015. Several plants including were infected with the NA-1 clone including Camellia, Gaultheria, Mahonia, Pieris, Rhododendron, Vaccinium, Viburnum and Vinca. Although eradication was completed it is suspected that the pathogen will persist and efforts are focused on containment. Annual ryegrass toxicity — Rathayibacter toxicus – This bacterial pathogen found in Australia, South Africa, Japan, and New Zealand infects annual ryegrass and other grasses with the aid of a nematode vector (Anguina funesta). The bacterium infects the seed heads, replacing the seed with a hardened yellow gall made up of bacterial cells. The bacterium also produces a toxin that is deadly to livestock, causing a disease known as ryegrass staggers. The best control method is preventing the introduction of this bacterium so Oregon has adopted a state quarantine for this disease. Bacterial Blight of Grape — Xylophilus ampelinus – This bacterial disease, limited to grapevines, is found primarily in Europe and South Africa with unconfirmed reports from other continents. Status in South Africa is unknown as it does not occur frequently and it is now listed as eradicated from Turkey. Severe infection of susceptible cultivars can lead to serious harvest losses. Natural dispersal is limited to the vineyard and the immediate area. This disease is liable to be carried on infected grapevine planting material. Further spread could lead to severe economic losses; especially since no efficient control measures are known. The bacteria attack the vascular system causing shoot blights and cankers and occasionally leaf spots. Symptoms are observed in early spring to June. Initially, linear reddish-brown streaks appear, extending from the base to the shoot tip; then, lens-shaped cracks and cankers develop, sometimes as deep as the pith. Shoots subsequently wilt, droop and dry up. In cases of severe infection, a large number of adventitious buds develop, but these quickly die back. Infected shoots are shorter, giving the vine a stunted appearance. Cross-sections of stems will reveal browning of the tissues. Leaves may develop angular, reddish-brown lesions; margins or the entire leaf may die. Light-yellow bacterial ooze may be seen on infected leaves when humidity is high. May be confused with Phomopsis cane and leaf spot as well as a few other diseases. Hazelnut bacterial canker — Pseudomonas avellanae (P. syringae pv. coryi) – The bacterium causes a hazelnut decline and is currently present in about 1,000 out of the 20,000 hectares of hazelnut orchards in central Italy. It has also been found in northern Greece. The main symptoms include the rapid wilting of twigs, branches and trees during spring and/or summer. Characteristically, the leaves remain attached to the twigs after their withering. Elm Yellows — Candidatus Phytoplasma ulmi – This disease, also called Elm Phloem Necrosis, is caused by an organism similar to a bacterium called a phytoplasma. This ultra-microscopic pathogen only survives in cells of an infected plant or its insect carriers. The whitebanded leafhopper is one of the known carriers of the EY phytoplasma, but there may be other phloem-feeding insects that are carriers. Leafhoppers pass the phytoplasma into phloem cells while they feed, and soon after, all of the phloem in a tree is infected and dies. The tree responds outwardly by wilting, often within one growing season. It occurs in the eastern half of the US and in southern Ontario, erupting in localized epidemics. Poplar canker — Xanthomonas populi – Only Populus species are affected. It occurs mainly in Europe but reports from Asia are doubtful. Found naturally in wild Populus tremula, but is more damaging to hybrids of Populus canadensis. Other highly susceptible species include Populus trichocarpa, Populus deltoides and Populus tremuloides, which are commonly used in European poplar breeding programs. Infections in young stems spread throughout the cortical tissue, eventually causing the tissue to split open. These cankers may produce bacterial slime in the fall. The bacterium is also capable of taking advantage of tunnels created by larvae of the cambial miner, Phytobia carbonaria, and spreads through these to form elongated cankers. Willow watermark disease — Brenneria salicis (formerly Erwinia salicis) – This vascular pathogen spreads within the xylem of infected trees. All willow (Salix) species are more or less susceptible. The bacteria invade the wood of diseased trees, overwintering within the tree and invading new annual rings each year, often by way of feeding tunnels left by insects. The role of insects in local spread of the disease has not been proven. Spread is known, however, to occur as a result of propagation of diseased willow. Found in Japan and Europe (Belgium, Britain, Germany, Netherlands, Austria [reported, but not confirmed]). Blackberry yellow vein — Blackberry yellow vein associated virus (BYVaV) and Blackberry virus Y. – Blackberry yellow vein disease has emerged in blackberries in the Southern and Southeastern United States causing significant losses and in some cases, plant death. Blackberry yellow vein disease is caused by co-infection of at least two viruses with as many as five viruses detected in symptomatic plants. The virus complex can vary significantly with more than a dozen viruses identified from plants exhibiting these symptoms. Blackberry yellow vein is a disease with symptoms similar to those attributed to Tobacco ringspot virus. Using nematodes to transmit Tobacco ringspot virus from symptomatic plants to blackberry plants free of known viruses showed that plants singly infected with Tobacco ringspot virus are symptomless. Symptoms of blackberry yellow vein disease include progressive leaf vein yellowing, poor fruit flavor, dieback of floricanes, and bush decline. Vein yellowing occurs on floricanes and primocanes, with young leaves on primocanes appearing symptomless. An electron microscopic examination of sap from symptomatic leaf tissue can reveal flexuous rodshaped virus particles, but this is not a suitable means for detection. Plum pox — Plum pox potyvirus – The disease was found in North America for the first time in 1999 in Pennsylvania and has now been detected in New York and Michigan as well as Ontario and Nova Scotia, Canada. This resulted in an immediate quarantine on U.S. Prunus nursery stock headed for Canada; cherry nursery stock was later removed from the quarantine. Surveys for the virus in 2000 and 2006 did not find the virus in the Pacific Northwest nursery industry or cherry orchards. After years of eradication efforts, Pennsylvania was declared free of the virus in 2009, meeting the requirement of three consecutive years of testing negative. Known strains include D, which has been found in Pennsylvania, M (most severe), C (cherry), and Ea (El Amar). Globally, PPV is the most economically important virus of stone fruits. PPV infects all Prunus fruit tree species, almond, and many ornamental trees. In Europe, wild Prunus species are reservoirs of the virus. PPV is transmitted by aphids in a nonpersistent manner and is retained by the aphid for no more than a few hours. Aphids appear to spread the virus not to immediately adjacent trees but to trees several spaces away. Systemic spread of the virus within a tree may take several years; in the meantime, the virus may be distributed very irregularly. Long-distance spread is through distribution of infected budwood and nursery stock. Sheep Pen Hill Disease in New Jersey — New Jersey strain (BlScV-NJ) – Blueberry scorch virus (BBScV) was first observed in a Berkeley blueberry planting near Puyallup, Washington in 1980 and has been observed in western Oregon and Washington (near Puyallup and in Clark County), in the Fraser River Valley of British Columbia in 2000, and Whatcom County in northern Washington in 2012. BlScV with more severe symptoms was reported in British Columbia during the summer of 2000. Based on symptoms, it closely resembles the New Jersey strain of BlScV, known there as ‘Sheep Pen Hill Disease.’ It is appears that the greatest diversity of BlScV is in B.C., suggesting that virus originated there, likely in a native Vaccinium or related species. The New Jersey strain of BlScV causes symptoms in all cultivars except ‘Jersey’, whereas the west coast strain is symptomless in ‘Bluecrop’ and ‘Duke’ as well as several other cultivars. Since BlScV was found throughout the main blueberry production areas of BC, all planting material from BC should be considered suspect and potentially infected with the virus. Pale Potato Cyst Nematode — Globodera pallida – Wide distribution in potato-growing regions of Europe. It has been reported from South America, Asia, Africa and Newfoundland and was confirmed in Idaho during 2006. The pest was confirmed in seven infested fields totaling 911 acres, within a one-mile radius in Bingham and Bonneville Counties, Idaho. The infested fields, and an area surrounding the fields, were placed under a Federal Domestic Quarantine Order and parallel State Rule in August 2006, establishing restrictions on movement of certain regulated articles from Idaho in order to prevent the spread of G. pallida. As a result of ongoing intensive soil sampling, an additional 20 infested fields have been found in the area. All 27 infested fields lay within an 8.5-mile radius. Fields associated through shared tenancy, farming practices, equipment, and/or shared borders have been extensively surveyed and are also regulated. Very narrow range: potato, tomato, and some weeds. Golden nematode — Globodera rostochiensis – Although this nematode is not currently on the “100” list, it is a cyst nematode of quarantine importance. It was found in 1965 on the southern portion of Vancouver Island BC. Restrictions have reduced the number of sites that have tested positive but two sites remain infested. The nematode was discovered in the United States near Hicksville, Long Island, NY in 1934 when a farmer noticed a few isolated spots where the vines were stunted and off-color. The nematode had probably been present 20 years in the original field before it was identified. The first infestation outside Long Island was discovered in Steuben County, NY in December 1967. Additional infestations have been discovered since in upper New York State in other counties. Regulations are in effect for the two agricultural counties of Long Island and seven upstate New York counties. Commercial plants infected by this nematode are potato, tomato, and eggplant. Wild plants known to be infected all belong to 90 species of Solanum, several of which are found in this country, but most are found in South America, the indigenous range of the nematode. Ogawa, J.M. et al. 1995. Compendium of Stone Fruit Diseases. St. Paul, MN: APS Press. Parisi, O., Lepoivre, P., and Jijakli, M.H. 2011. Development of a quick quantitative real-time PCR for the in vivo detection and quantification of Peach latent mosaic viroid. Plant Dis. 95:137-142. Rott, M., Lawrence, T., Belton, M., Sun, F., and Kyle, D. 2010. Occurrence and detection of Globodera rostochiensis on Vancouver Island, British Columbia: An update. Plant Dis. 94:1367-1371.